If you’re thinking about upgrading to LED Pool Lights, there are some things you should know before you buy. In this article, I hope to give you all the information you need to know about buying a LED pool light. 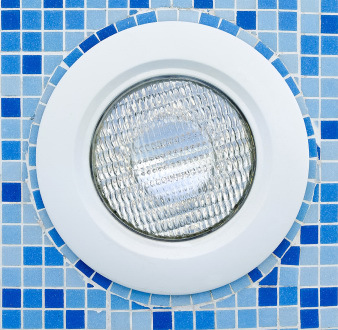 Up until now, LED pool lights haven’t been as popular as halogen pool lights. And for good reason. Halogen lights have been much cheaper, brighter & easy to service. LED pool lighting technology has come a long long way in the last 5 years. In fact LED lights are revolutionising all lighting applications including swimming pools. They are now cost effective to produce, have high light output and use a fraction of the amount of energy as traditional lights. There really is no good reason not to choose LED lights. There’s no straight answer for this question. It depends on many factors. A lot of LED lights are just as bright as halogen these days. LED swimming pool lights are made up of many LEDs inside them. Many consumers think that lights containing more LEDs must be brighter. You can’t just compare the number of LEDs in a light or the power (Watts). The overall brightness of the light also depends on the efficiency of the actual LEDs themselves – a factor called luminous efficiency. This is a measure of how efficiently the LED uses power (Watts). The higher the luminous efficiency, the more efficient the LED is. Meaning, a 20 watt LED light may have the same brightness as a 40 watt LED light, if the LEDs are twice as efficient. For a more thorough review on LED and Halogen lighting, check out our article: LED Pool Lighting: LED Vs Halogen. Quality LED pool lights illuminate the pool much more evenly than halogen lights. Halogen lights give more focused light (think of a torch beam), whereas LED pool lights spread the light more giving a glowing effect. LED pool lights are available with different beam angles. This means some lights will spread the light 180 degrees, providing a broad coverage. Others will provide a narrow beam, which is useful for focusing light on one area to highlight a feature or create an effect. What you choose depends on the overall lighting effect you are trying to achieve. Choose a wide beam angle (150-180 degrees) if you’re trying to light a large area. If you’re lighting a feature item, choose a light with a narrow beam angle. There are a number of well established brands on the market as well as some more generic lights. The more established brands tend to be good quality lights however you pay around two times the price for a brand name light ($380 to $700) versus a generic branded light. Generic branded lights available from places such as eBay or the web, can be good quality too, although brand name manufacturers will refute this. If you buy a generic light, make sure you buy from an established business that will stand by their product. Also search the internet for feedback from other people who have bought the product. The prices for these are around $180 to $400. How Many Lights Do I Need? Where Should I Put Them? There are formulas to work out the number of lights needed but unfortunately it’s not normally as simple as that. You need to take into account the pool size, shape, pool surface, the output of the pool lights, the colour of the light and the purpose of the light (are you trying to light an entire pool, a certain feature or perhaps create an effect). Planning pool lighting does require a level of expertise and is best left to the professionals. But as a rough guide, the brighter LED pool lights will light most medium sized (8-10m long) rectangular shaped pools with only one light. You’ll need more lights if your pool is a different shape or larger than average. You may also need more lights if the surface of your pool is a dark colour. For an average pool, place it either in the middle or at one end of the pool. If you place it at the end of the pool, place it so the light faces away from the house. It looks better when you can’t see the source of the light. For a more detailed look at positioning lights, take a look at our article, complete guide to pool lights. There are two ways to mount swimming pool lights; flush or surface. Surface mounted lights will fit where a flush mounted light was but a flush mount won’t fit where a surface mounted light was (well, not without extensive renovation). 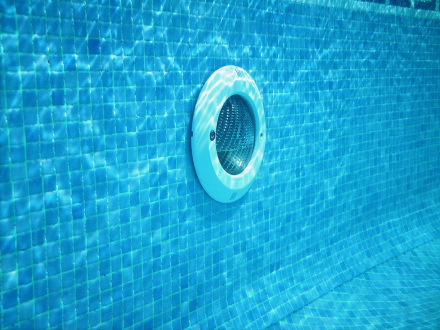 A flush mounted light is installed inside the wall of the pool in a recess sometimes called a niche. The exterior of the light is normally flush with the pool wall or very low profile. The trend today is flush mounted pool lights. They look better and they are much less likely to be damaged by swimmers using them as a step, since there are no protruding surfaces. Installing a light this way is almost always done at the time of construction. 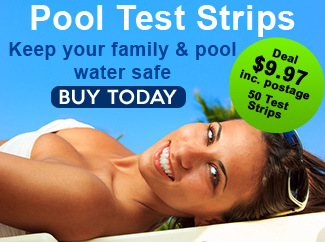 It’s very expensive to do it afterwards and unless the pool is undergoing extensive renovations, it’s not worth doing. A surface mounted light is mounted on the surface of the pool wall rather than inside a cavity in the wall of the pool. These lights protrude far more than flush mounted lights do. However, it’s far easier to replace existing pool lights with surface mounted lights. What is a Resin Filled LED Pool Light? Pool lights need to be sealed to stop pool water getting in. The most common method is to seal the light with a rubber gasket or O-ring. There is now an increasing trend to fill the inside of LED lights with a resin, which totally seals and the electronics inside. This prevents the possibility of any water getting in and eliminates the need for a seal. Resin filled pool lights are not serviceable. If something goes wrong with it, you will need to replace the entire light fitting. Upgrading to a LED light is possible for most pools. Providing there is enough excess cable to lift the light out of the water, you probably won’t even need to lower the water level to do it! Some LED pool lights come with a special universal bracket which allows the new light to be screwed on without the need for new holes to be drilled in the wall of the pool. If you can get a light like this, it will make the job extremely easy. After you screw the light to the pool wall, the only other thing that needs to be done is to connect the existing cable to the new light. This can be done in one of two ways. Some lights have terminals on them. You’ll need to open the terminal housing, strip the ends off the old cable and then screw the cable into the terminals. The other method is by using a wire splice kit which sometimes comes with the light. You simply join the old cable ends to the cable that came with your new light. You may also check out our other article for further information on how to fit an LED pool light. What Cable Length Do I Need? Pool lights often come with a choice of wire lengths. For new swimming pools, your builder will probably determine the length needed. When replacing your pool light, you will normally only need a short cable (1-2m). Kits to join the old and new cable are available (splice kits). If the cable is old or too short, it may be necessary to install a new cable. In which case, you’ll need to measure the distance from your pool light to the pool light transformer to calculate the length needed. The transformer will be located with your pool equipment or inside the wall of your house where the pool light switch is located. The lifespan of the LEDs in pool lights is 50,000 to 70,000 hours (23 to 30 years using 6 hours per day). This is much longer than the lifespan of halogen globes (which normally need replacing every season). Notice I said the lifespan of the LEDs? Even though the LEDs themselves have a long lifespan, it doesn’t mean other parts in the light won’t break. Some of the problems with LED Pool Lights are the housing and transformer or other internal electronics. In reality, these components will probably fail long before the LEDs will. Many of the new LED lights allow you to easily change the colour of the light – some have 16 different colours or more (from white to purple to green). This is done with the remote control or on the light controller that came with the light. Some LED swimming pool lights come with a remote control allowing you to turn the light on or off or change the colour with the press of a button. Premium models can even be controlled from your Smartphone with an app.! Pool Light Transformers & Voltages – What does this mean? For safety, pool lights use a much lower voltage than your house supply. To lower the voltage, a transformer is used. It’s normally located with the pool equipment or inside the wall near the light switch for your pool light. LED pool lights come in a several different voltages (36V, 32V, 24V, 22V and 12V). For most pool lights, you need to make sure the transformer’s voltage matches the light. Some of the new LED pool lights are equipped internally to use any of these voltages – often called auto voltage detection. In this case, you can use your existing transformer (Provided the wattage is enough – which it normally will be if you’re upgrading from halogen. The wattage specifications will be on the existing transformer and in the instructions of the new light.). If your new LED light doesn’t auto-detect the voltage and the voltage of the transformer you have varies from what’s needed, then you’ll need to replace the transformer. After reading this article, you should have everything you need to choose and buy your LED Pool Light. As always, do your research and compare brands and different models and choose what is right for you.